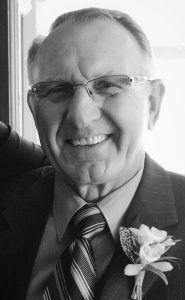 DARREL ORCUTT, beloved husband of Dana Orcutt of Coaldale, passed away peacefully, surrounded by family at the Chinook Regional Hospital on Friday, April 5, 2019 at the age of 72 years. Darrel is survived by his loving wife Dana of 52 years, son Russel (Lisa) Orcutt, daughter Megan (Tony) Curtis, grandchildren Brody, Mackenzie and Colton, his dad Lloyd, sisters Colleen (Ernie) Boucher, Shelley (George) Goertzen, Patti Wright and their families. He is also survived by Dana’s brothers, their families and an abundance of friends. He was predeceased by his mom Maude, in-laws Felix and Marion Ober, and brother-in-law Gord Danielson. Darrel was born in Lethbridge and grew up in and around Coaldale. After attending Readymade and Kate Andrews schools and working on the Orcutt and Ober farms, Darrel left for Ottawa to study meteorology. This experience took him to Watson Lake, Yukon. After marrying Dana in 1967, they moved to Calgary where Darrel worked as a seismologist for Western Geophysical. This career took Darrel and Dana to Cairo, Egypt from 1969 to 1971. After returning from Egypt, they moved to Picture Butte where Darrel bought and operated an Esso bulk fuel and fertilizer business. In 1975, Darrel and Dana moved to the family farm working alongside his folks until their retirement. Darrel and Dana continued to farm until 1997 when they moved to Coaldale. After a brief experience with retirement, Darrel joined the Perry Produce family, enjoying a return to his love of farming. Darrel loved golfing, camping, curling, hunting and travelling. Time spent with family and friends making wonderful memories was what he cherished the most. A Celebration of Darrel’s Life will be held at READYMADE COMMUNITY CENTRE, 90005 Highway 512, Lethbridge County, AB (20 km east of Lethbridge, on the corner of 512 east and 512 north) on Saturday, April 13, 2019 at 12:00 P.M. with a reception to follow. In lieu of flowers, donations are welcome to either the Gem of the West Museum: Box 343, Coaldale, AB T1M 1M4, or to the Alberta Cancer Foundation (c/o Chinook Regional Hospital Foundation): 960 – 19 Street South, Lethbridge, AB T1J 1W5. Our curling days bring back fond memories. Dana our thoughts are with you and your family.